Born 25th August 1894. At the outbreak of WW1 he joined the Artists Rifles and obtained a commission in the London Regiment - 2nd Surrey Rifles in September 1914. In July 1915 he joined the 1st Battalion in France, where he was appointed the Bombing Officer and he took part in the Battle of Loos where he was badly gassed. He was shot and killed by a sniper the following January after successfully carrying out dangerous observation work. He is buried in the MAROC British Cementry in Grenay (Pas de Calais), France. Born 21st June 1893 in Belfast and was educated at Campbell & Queen’s Colleges. During the WW1 he served with the 36th Divisional Cyclists and later at the Headquarters of the 27th American Division. After the war he became the Secretary of the British National Committee of the International Chamber of Commerce. He was awarded the Backs Honour Tie for the 1920-21 season. He died in October 1932. Major-General William Brooke Purdon C.B., O.B.E., M.C. Born in Belfast on 28th November 1881, and educated in Queen’s College taking medicine. 2) A representative of the Government of Northern Ireland in London. In 1907 he joined the Royal Army Medical Corp and later served in the Great War with distinction. He was awarded a Military Cross and a D.S.O. and also mentioned in despatches. From 1930 to 1934 he was Assistant Director of the Hygiene at the War Office and then after a brief spell in Egypt, he became the Professor of Hygiene at the Royal Army Medical College, and later the Commandant & Director of Studies. He was also the Medical Superintendent of Queen Mary’s Hospital at Roehampton. He was Honorary Surgeon to the King from 1938 to 1941, and from 1940-41 the Deputy Director of Medical Services, Western Command. In 1946 he accepted the post of Northern Ireland Government Agent in London. William Brooke Purdon won 3 Ireland caps in 1906. 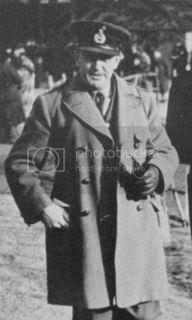 He was the President of London Irish from 1949 until his death in 1950. Born in 1917 at Bishops Canning in Wiltshire and educated at Cheltenham College. On 4th March 1939 he was commissioned as an acting Pilot Officer in the Royal Air Force. After a mission to attack the oil tanks at Bordeaux in August 1940 he received the Distinguished Flying Cross. He was awarded the Distinguished Service Order in May 1942 for numerous attacks with No.49 Squadron on enemy targets varying from factories in Germany to supply ships. On 3 different occasions he flew his severely damaged aircraft back to the U.K. He was awarded the Backs Honours Tie for the 1938-39 season and also played for the Surrey Wanderers. He was reported missing in 1942 and presumed dead later in the year. Runnymede RAF Memorial (Panel 65). Born in Ringabella, Co. Cork in 1906. He took a short service commission in the R.A.F. in 1925, and was awarded a permanent position in 1928 and was stationed in Mosul and Aden. At the outbreak of World War II he was stationed in France and was mentioned in despatches for brilliant work with the advanced Air Striking Force . In 1940 he became a Wing Commander and two years later a Group Captain. He was given command of a bomber station after being posted for engineering duties. He played for Forest Hill House School, The Midland Bank, the R.A.F. XV in 9 Inter-service matches, as well as representing the Combined Services and playing country rugby for Kent. He played for London Irish for 10 seasons, and took part in an Ireland trial. An all-round sportsman he was also an accomplished cricketer who played for the R.A.F. for over 7 years. Whilst at school he scored a century and then took all 10 wickets. He was reported missing in September 1943, leaving behind a widow and 2 sons. He is buried at the Rheinburg War Cementry. Born 2nd December 1908 in Ireland. “Alphabet” as he was known to his team mates was a three quarter back who also played for Rugby, Rosslyn Park, the Army, The Barbarians and county rugby for Hampshire & Kent. He won 5 caps for Ireland between 1930 & 1933. In 1932 his Achilles heal snapped, so he took up Polo. He was reported missing after the fall of Hong Kong and officially reported killed during the fighting at Wong Nei Chong Gap, Hong Kong on 20th December 1941. He served with the Royal Engineers. E.W.F. de Vere Hunt, the Irish full-back and centre three-quarter, was just one of the host of outstanding players who have added something out of the ordinary to my rambling story. That he won a tense game against Newport by dropping a goal in the last minute it is worth mention though not more so than other match-winning feats I have recalled. “Ted” Hunt, however, developed into one of the many personalities who added gaiety to Barbarian occasions both off and on the field and I will never forget how a fantastic run he made at Cardiff gave the crowd at the Arms Park surely the biggest laugh they ever had. It was so comical and altogether extraordinary that it reduced nearly all the players, friend and foe alike, to a state of laughing immobility. Hunt was on his first tour and playing full-back when he won the match at Rodney Parade in 1929. I can see him now, a tall athletic figure with the fresh complexion of an unshaven boy, his flaxen hair parted in the middle and wearing Rosslyn Park stockings. He had been competent in everything ge did, but hardly looked like making a memorable contribution to the game. Newport, with only about a minute to play, were leading by a penalty goal kicked by their international full-back, Bill Everson. We, however, were attacking strongly in an endeavour to save the game when, to the consternation of the home supporters, for they seldom see such things, a wild clearing kick went upfield towards Hunt, who was standing on the centre spot. “Ted” gathered that rather round pumpkin of a ball and, with the calm assurance of a Bancroft, to everyone’s amazement he sent it sailing between the posts with a beautiful drop kick. That meant four points in those days and altogether unexpected win for us. Hughie and I walked round to the station together for the journey back to London and all the way we hooted with laughter as we discussed our win and how “Ted” had seemed the most unlikely player in the wide world, as he stood on the field, even to have a go let alone score from 50 yards range. 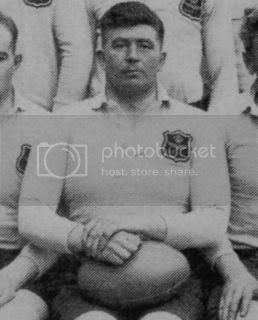 As a prelude to the Cardiff incident I have to explain that when playing for Ireland there a few weeks earlier in the 1932 international which Ireland won 12-10, Hunt had caused Wales a lot of trouble, one being the manner in which he got out of seemingly safe tackles. Against Cardiff we were playing towards the Taff end and pressing in the vicinity of the “25” flag on the new stand side near the players’ entrance. From a maul Cardiff got the ball. It went back to Harry Bowcott at stand-off and instead of clearing to touch down the stand side he kicked away across towards our “25” on the opposite side. I was running the line in front of the old stand and had a perfect close-up of all that happened. The ball did not reach touch by a bit. It kept rolling and bumping, and with R.W. Langrish as full-back guarding the line on the other side, “Ted” Hunt came after it, an easy first. As he ran back after it, however, he could not gather it. He kept knocking it out of his reach as Little Tich used to do with his elongated boots when he was trying to pick up his silk hat in his well-known comic stage act. By this time four Cardiff forwards, with a glint in their eyes which showed they were not going to allow Hunt to repeat his “international” nonsense, were closing for the kill. “Ted” at last picked up the ball, but no sooner was it in his hands when the human avalanche arrived. Crash, bang, wallop, thud, thud, thud, and as I looked to see if no help was coming “Ted” suddenly jumped out of the welter of arms and legs and raced away straight across our “25” line. Langrish, who had got back to the vicinity of the posts, like everyone else was bewildered and I thought to myself, “Good heavens, he’ll be away out the other side of the ground and up Westgate Street if nobody stops him”. However, when he was nearly at the other side “Ted” apparently took a look at his compass, suddenly changed direction and went tearing up the other side of the pitch. After whistling past about only two Cardiff players capable of moving, Hunt found Ben Tod racing alongside, although he, too, was bursting with laughter. Then, as if to say “That’s been great fun, Ben, you have to go now,” Hunt gave the ball to Tod who scorched the remaining 30 yards or so to score an astonishing try which Brian Black converted. My other yarn about Hunt is all-Irish, he and Paddy Coote as opponents at centre taking part in a wildly exciting race which ended not with a try but a great try saving tackle in the Leicester match of 1931. Play was close to the Tigers’ line and our full-back, Leslie Bedford, joining in an attack which broke down. In a flash Paddy Coote gathered the loose ball and set off for the pavilion end with no one to beat. When Hunt took up the chase he was more than a good five yards behind and as Coote crossed the centre line it seemed he was bound to score. Running like a man possessed, however the Baa-Baa skipper gradually narrowed the gap, and as he closed the roar of the crowd was tremendous. Fifteen yards to go, then ten and Hunt was still just out of distance. But when it looked hopeless he hurled himself through the air and made a brilliant tackle which felled Coote to the ground just inches short of the line. Captain Hugh Christopher Browne C.B.E., D.S.O. Born 5th January 1906. Miles Delap was the pilot of the first aircraft to sink a u-boat in WWII. Whilst serving with 82 Squadron Blenheims of RAF 2 Group Bomber Command U31 was spotted and attacked with 4 bombs and 2 hits were observed. The submarine disappeared and 58 crew died. U31 was raised and recommissioned only to be sunk again in November 1940 (the only ever U-boat to be sunk twice). Last edited by PaulHP on Tue May 20, 2008 8:34 am, edited 6 times in total. A great post on this particular day. Well done Paul. WEll done Paul - when I heard them read out the welsh caps who had died in the war before the Islanders match I wondered how many 'Irish' players had also died. It would be good to try and get an official and complete list and for us to be able to pay tribute to them in some way. Is there an official London irish historian or a great authority on the subject? Played for scrum-half for Wellington, St. Thomas's Hospital, London Irish, RAF & Munster. He was a reserve for Ireland in 1923. He joined the RAF in 1926 and was sent oversea's almost straight away, overwise he would have almost certainly won a Ireland cap. He played in 7 inter-service matches between 1926-34. He captained the RAF team that played the Royal Navy in 1934, unfortunately they lost 36-0. Served with the Royal Air Force Medical Branch. In 1941-42 he was the Principal Medical Officer at Air Headquarters in Egpyt, and in 1942-43 he held the same post in the Western Desert. He was known as a skilled Ostretrician and during WWII helped develop the air evacution of casualties. He was made a C.B.E. in 1944. He was also Director of Rehabilititation at Gartson Manor, also worked at the RAF Hospital in Torquay. At the Rehabilititation Unit at Loughborough he organised the provision of training facilities according to the needs of patients. He died suddenly on 25th January 1958 at the age of 57, he was survived by his wife and 2 married daughters. Educated at Epson College & St. Bartholomews Hospital. Between 1935-38 he was the assistant editor of the Lancet. During WWII he was awarded the Military Cross whilst serving in the Middle East for rescuing soldiers from burning tanks. He was later made the Chief Public Health Officer for the A.M.G.O.T. in Italy. In 1956 he emigrated to Australia and worked as Deputy Director of Psychiatrac Services in Tasmania. In 1958 he was appointed Inspector-general of Medical Services, Western Australia. He was found dead near the bush on the outskirts of Sydney in May 1963. Last edited by PaulHP on Mon Feb 11, 2008 11:32 pm, edited 4 times in total. Great stuff Paul, must take you ages to get this and the other info you put up here. Well done. An excellent, informative post, Paul. This kind of stuff must be kept somewhere more archival, less ephemeral than the message board, don't yous agree? I love reading about guys like Dr. Digby Moynagh. Challenges an Indian fakir to walk on burning coals..both end up with burned feet..goes on to become Director of Psychological Services in Australia! Well, you would, wouldn't you, with a CV like that? Great fellers.